Pizza, pasta, gnocchi, olive oil, sage - there is so much food & flavourings that Italy is famed for! Each area of the country has a slightly different take on the food and tend to eat local produce that is specific to their region. 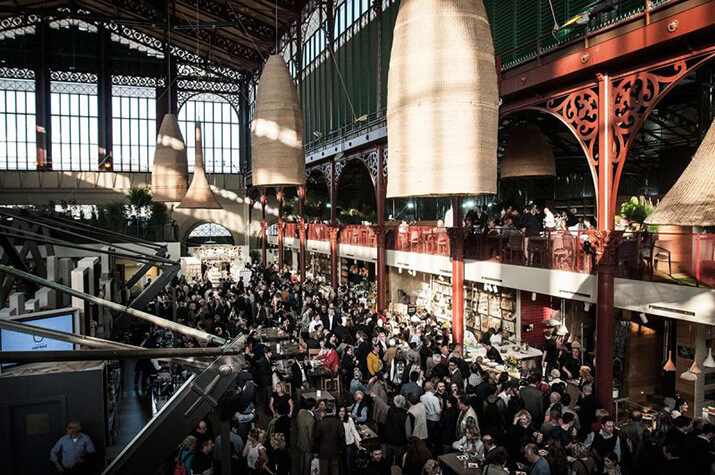 For the likes of Florence, there are a number of things that you must try when visiting. The bakeries aren’t all about sweet cake, but rather focus on the savoury of breads. When you come to visit Florence, there are 7 foods you have to try. Before reading this article, you might think you know the best Italian breads - and it’s not just pizza dough that makes Italians famous for their bread! There’s focaccia, bruschetta, ciabatta and schiacciata - and many others as well. 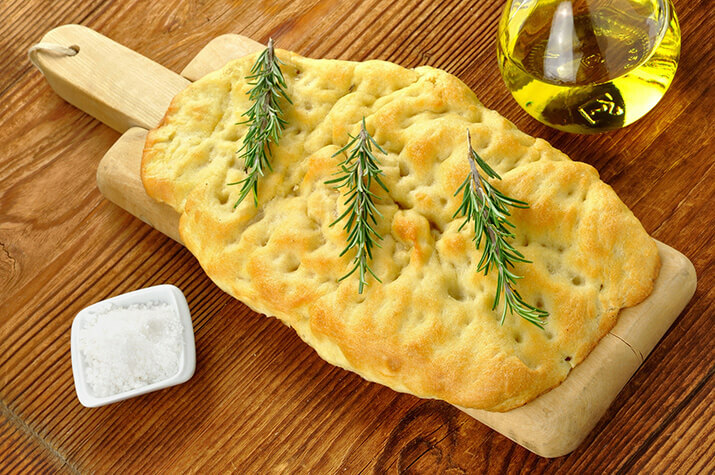 Not unlike focaccia, schiacciata is a flat bread that is drizzled with olive oil and salt. It can be served with a variety of different options, such as stuffed with salami and cheese! A staple in the North of Italy, beans are one of the things that define Tuscans - so much so that the Tuscans are often known as “bean-eaters”. Cannellini beans for example, are one of the key produces that are added to meals. 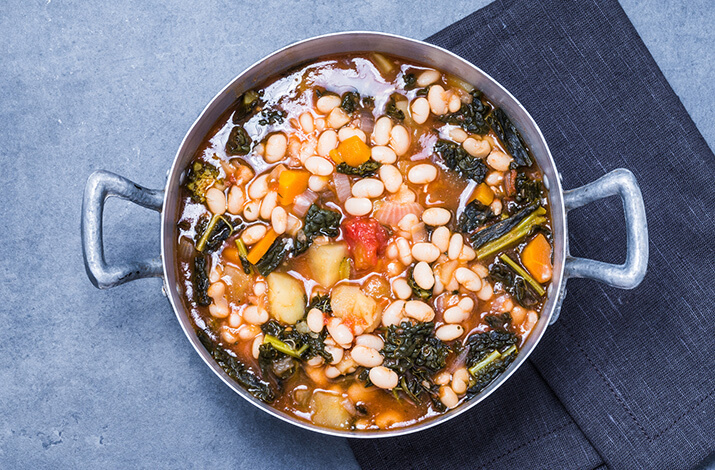 Zuppa di fagioli is a healthy soup dish that consists of cannellini beans which is stewed in olive oil and tomatoes. Although it is a simple dish, you cannot underestimate the taste that it brings when accompanied with some of the roast meats that are famous in Tuscany. Nothing beats a light salad when the weather is hot and it’s the height of summer. So, making use of the best flavours of Italy, a panzanella salad uses olive oil, balsamic vinegar, salt, pepper, dash of basil. The dish is a great way to use up ‘leftover’ bread, as it involves soaking chunks of bread in water, then drying it and adding the flavours mentioned above. This is all tossed together with some other ingredients, such as capers, mozzarella or lemon juice. Although we’ve had bread, soup and salad so far, what about the main course? A hearty dish that will fill that deep hunger for Florentine food and authentic Italian cooking. Bistecca alla fiorentina is a meat dish like no other. 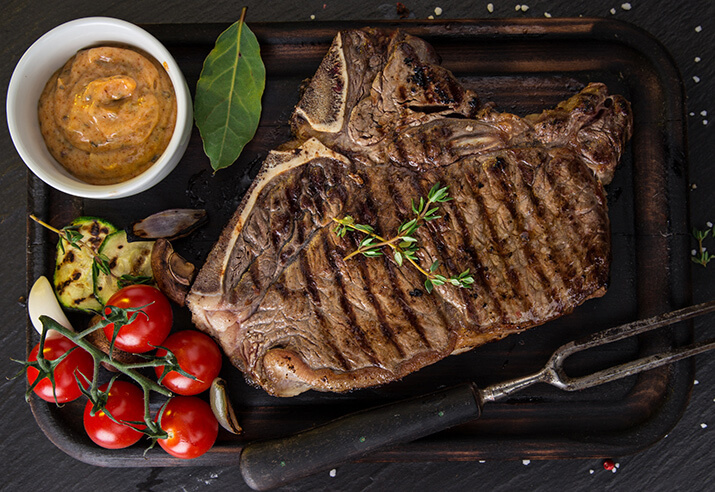 This is definitely not one for someone who struggles to eat a lot of meat, as the t-bone steak weighs over a pound and will more than cover your plate. The plate is essentially just a big portion of meat, with very little accompaniments, so that you don’t fill up on other produce. Just served with a little sprinkling of lemon, salt and pepper, the juices of the steak will speak for themselves. No meal is complete without a sweet to finish. Schiacciata alla fiorentina is a kind of sponge cake which is coated in vanilla and lemon sugar. The best way to finish any meal! After reading this article about food in Florence, you have to experience it for yourself - it’s not enough just to read about the food - it’s all in the tasting! We have a number of tours in the Florence area that will help you to explore the food and wine. Whether it’s a small group tour in Florence itself, or a day tour in Tuscany getting to sample food and wine, or you might just want to explore the food markets of Florence and get a taste of the culture of the city. Look no further than Avventure Bellissime for your next Italian vacation.